Info: This feature requires Content Station 10.33 or higher and Enterprise Server 10.1.4 or higher. Working on a print publication is team work and involves many steps before the final product is completed. One of these steps is placing a created article on a layout. Depending on your workflow, this step can be performed by various people within the team and at various stages during the production process. In Content Station, the tools for placing an article on a layout are available in the fullscreen mode of a layout. 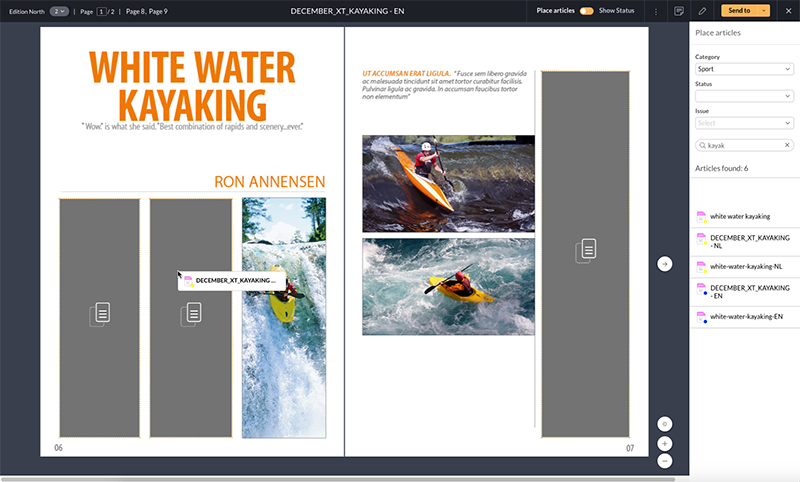 Opening a layout in fullscreen mode can be done anywhere in Content Station, including the Publication Overview application. Please note that an article can only be placed in a frame on the layout if that frame is part of an InDesign Article. Content Station will inform you when the layout that you open does not contain such frames. Note: Making a frame part of an InDesign Article is done in InDesign. It is assumed here that the layout that is opened contains InDesign Articles. Step 1. Open the layout in fullscreen mode. Step 2. At the top of the screen, make sure that the switch is set to Place articles. The 'Place articles' panel appears on the right side of the screen and the layout changes to a mode that makes it possible to place articles in a frame. A list at the bottom of the panel containing all articles that can be placed. By default, the list shows all articles that are available in the Brand that the layout is part of. A Filter at the top of the panel for narrowing down the results in the list of articles. Figure: The 'Place articles' panel contains a Filter (A) and a list of articles that can be placed on the layout (B). Step 3. (Optional) Use the Filter to narrow down the list of articles. Step 4. Drag the article from the panel and drop it onto the frame on the layout. Note: Frames in which an article can be placed can be recognized by the dotted orange border. When hovering the mouse pointer over such a frame, the background changes to a dark color and an icon is shown on the frame. Figure: Frames into which an article can be placed can be recognized by their orange dotted border (A) or the dark background and icon when hovering the mouse over them (B). Figure: Placing an article onto a layout by dragging it from the Place articles panel. The article is placed, the layout is saved and the layout preview is updated. Step 5. 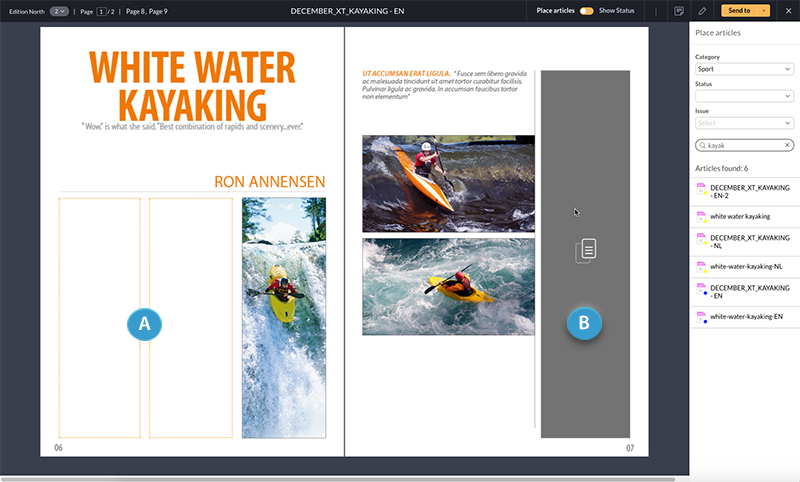 (Optional) Double-click the article to open it in the Print editor to further edit it such as copyfitting or to place images on the layout. This means that the layout does not contain any frame that is part of an InDesign Article. Articles can only be placed on a frame if that frame is part of such an InDesign Article.